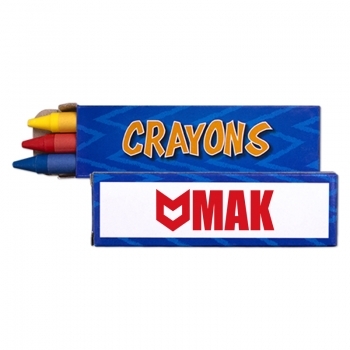 Customizing your brand name with custom 3 pack crayons is a cool brand promotional idea for schools and nurseries to create a pride in the kids about their educational institution. The schools can use these to get identical coloring sets for the students. The promotional 3 pack crayons are fun tools for children who are interested in art works. Even the adults can use them. These are available as a packet of red, yellow and blue crayon sticks. Since CPSIA approved, the parents can stay easy. Diverse business verticals like hospitals, banks and libraries can make use of these personalized 3 pack crayons. The crayons measures 3 1/2" X 1 1/8"; 90MM and offer enough space to imprint brand name and logo to promote it. Triple the fun of advertising through the custom 3 pack crayons. Imprint Area : 2" X 3/4"